ClosePuppyMills.com proudly collected nearly a THOUSAND signatures via paper petition last year! Thanks to all of the kind people who signed at our events. We have forwarded those "Petition to End Puppy Mills" signatures to Tom Vilsack at the USDA. The USDA is responsible for the inspection of kennels & the enforcement of humane laws for the dogs lingering in these filthy kennels. More and more cities than ever before across this country are now enacting ordinances to prevent the sale of puppy mill dogs in retail stores, according to Elizabeth Oreck of 'BEST FRIENDS' Sanctuary in Utah. "The increase in momentum shows that more people are aware of puppy mills and that communities want to take action against them". We will end the torture of these dogs for profit! Please speak up to your city and state legislators. Libre was the tiny puppy rescued from the property of a puppy mill in Lancaster, PA. A good samaritan found him on the property almost dead, infested with maggots and rotting flesh and then rushed to the Vet who said it would be a miracle if the puppy survived! He was starving, in pain and barely conscious. Please read the incredible story of this tiny puppy with an undeniable will to live. Since his rescue on July 4th, 2016 he has made an amazing recovery! This story and pictures will bring tears to your eyes and make you wonder how any human could walk past a suffering helpless tiny puppy and do nothing. THIS is what happens in puppy mills every day. 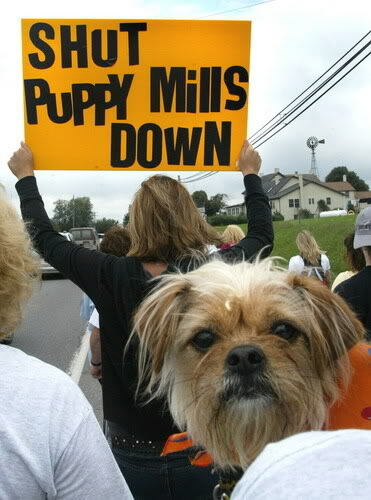 Missouri is the Puppy Mill Capitol of the country with more torturous puppy mills than any other state in the country. Not coincidentally, the largest puppy mill BROKER, The HUNTE Corporation, is also located in Goodman, Missouri. It's estimated that they buy approximately 2000 puppies a week, from puppy mills, and then sell them to PET STORES (including PETLAND) all over the country. The puppies are loaded into the backs of trucks (with NO windows) and many innocent puppies have died at the hands of The HUNTE Corporation, some from truck fires and some from heat exhaustion in NON air-conditioned trucks. See the violations for yourself. "You may never know what results come from your action, but if you do nothing there will be no result"
If you think that you are driving up to Pennsylvania to get a puppy from a "nice farmer" and his "pet" dog..THINK AGAIN !!!!! 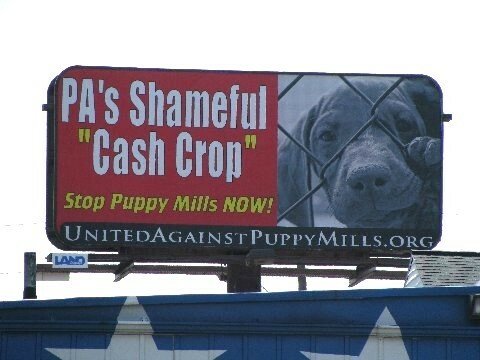 Pennsylvania is loaded with "FARMERS" who OWN puppy mills. So very many people are fooled into thinking that they are NOT puppy millers but in fact .. THEY ARE ! People always say "but he said he is a BREEDER". Well ... puppy millers ARE "breeders"! That is exactly what they are. It doesn't matter how NICE you think they are...they have hidden dogs who are suffering everyday only for the sake of making this "nice person" some money. A dog is killed in a shelter every 7 SECONDS in this country and only because they are so massively overcrowded. Please give one of these dogs a chance at a loving home. The only crime they are guilty of is not being able to find a home. PLEASE do not give these people your money for a puppy so that they can continue their "business" and continue and keep these helpless dogs in daily torture! THANK YOU from those who have no voice! The HSUS is offering rewards up to $5,000 for information leading to the arrest and conviction of a puppy mill operator for illegal animal cruelty!